When did you know you had found your wedding venue? Brandy ~ For us, one trip to the top of the mountain aboard the Silver Queen gondola was all we needed to know that the top of the mountain and The Little Nell was the perfect combination for our wedding ceremony and reception. During the planning, we were so impressed by the attention every small detail received. Brandy ~ For Mike, the buffalo sliders with green chili were his absolute favorite. I adored the hand-made pork tamales. We heard many compliments about the organic grilled veggies and the barbeque brisket. As we reflect on our culinary experience, every bite was, without a doubt, delicious. We were told that the food would be impeccable, but we were not prepared for the promise to be a reality – to our delighted surprise… IT WAS!!! Brandy ~ Watching the sky clear from dark grey and rainy to purple/pink with billowy clouds as I walked down the aisle to my groom. The Little Nell has very sophisticated technology that allows the staff to give you an idea of the weather at the exact time of your ceremony. This information helped me to make the decision to have the wedding outdoors when I was unsure of the weather conditions. On a side note, The Little Nell passed beautiful grey fleece blankets to all of our guests so that the chill in the air created a warm, fall memory for us all. 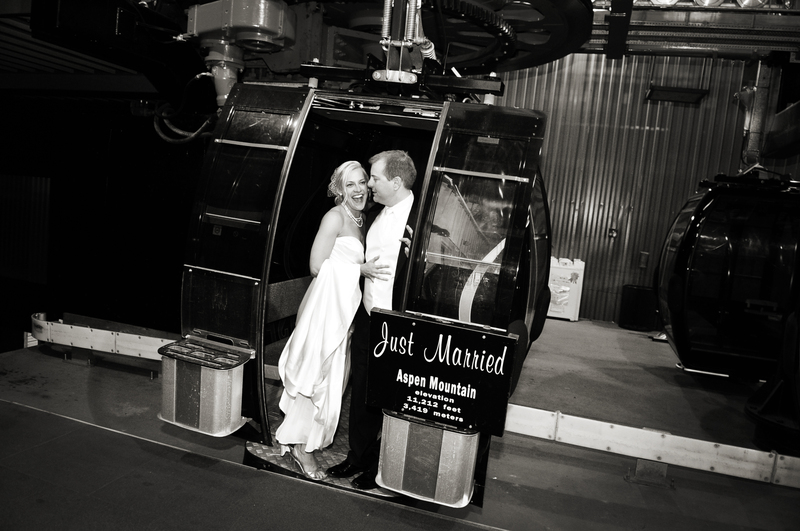 Mike ~ Riding down the gondola with my new bride was the highlight for me. After enjoying an evening of dancing together and celebrating with all our friends, we had some time alone to reflect on the evening and look out onto Aspen under the full moon. Decide what is most important to you, and budget around that! I wanted to be relaxed and enjoy my day as a bride, so I chose vendors that understood our wedding needs and worked within our budget to make our dreams come true. 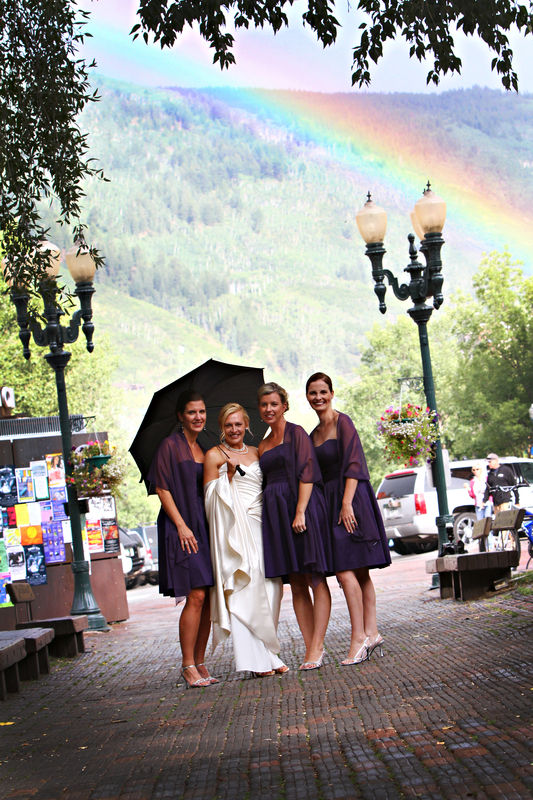 Our wedding day presented more than a few challenges with the unpredictable weather, but the staff of The Little Nell, in coordination with our other vendors, made sure that the challenges were minimized and our laughter was maximized. 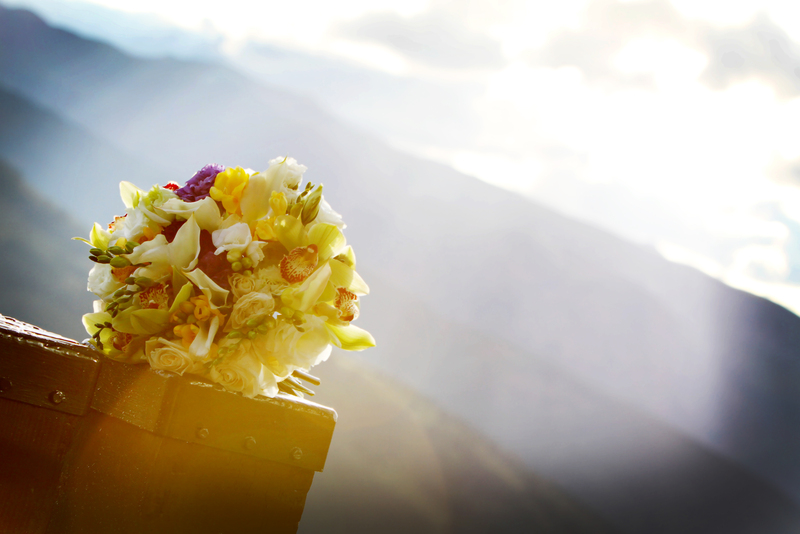 For an amazing video of this wedding by Rising Moon Wedding Cinematography, click here. COMMENTS ON "Wedding of the Month, Finley ~ McCracken Wedding"
BAR NONE! This is not the wedding of the month but the wedding of the decade. I could not have enjoyed myself MORE! So much love in every attendee and the best of love in the bride and groom. Any other venue would have been overshadowed by the humble joy and grandeur of the spectacular generous connection between Brandy and Michael. This is a wedding between two people who surpass in compatibility 9 out of nine couples. 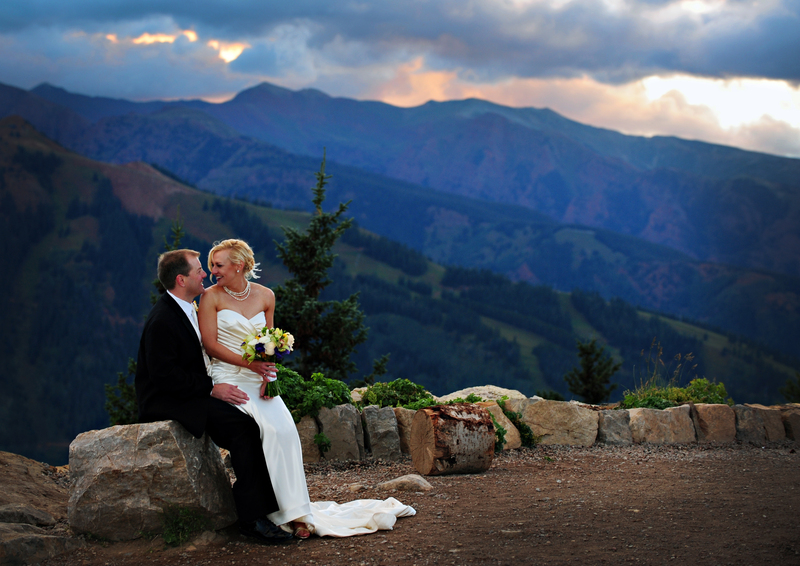 I have been to several mountain weddings. This wedding, this venue, topped them all! Brava Little Nell and Aspen (and the upheaval that made the Rockies. A feat, to say the least!